I was thrilled to join this month a group of journalists to discover a city from my native Belgium. Recently I have developed a lot of interest in the field of urban placemaking and regeneration and this was the perfect trip to explore these issues. Charleroi is a Belgian city located on the Sambre River. Wallonia’s largest agglomeration, this relatively young city (350 years old) used to be a major center for glass, metallurgy, and coal production during the industrial revolution. Sadly for many years, “le Pays Noir” has been neglected by politicians, abandoned by its inhabitants and labeled “the ugliest city” by the international press. This dramatic fall was caused by a series of tragic events and scandals including various episodes of industrial decline and factories closings, political corruption, serial killers and terrorism related affairs. Now the city is taking its fate in its hands. A great energy and dynamism have been diffused throughout the city to incorporate its glorious industrial past (old railways tracks, coal tips, old industrial buildings) in a new and unique urban development. The current Mayor has appointed architect Georgios Maillis, as Bouwmeester (head of planning) to lead the project. Maillis has worked for major architecture studios including Foster and Partners and Zaha Hadid Architects in London. Like in Bilbao, Liverpool or Birmingham, the Arts & Culture play a key role in the urban regeneration programme. The cultural offering of the city is already impressive. It includes among others numerous Art Deco and Art Nouveau treasure troves, several theatres, a world-renowned avant-garde dance company, a Fine Arts Museum, the largest museum in Europe dedicated to photography and BPS22, an art museum hosting monumental contemporary installations located in a former industrial venue in the centre of the city. The regeneration project is fully described in a 300 page document titled “Charleroi Métropole: un schema stratégique 2015-2025”. It tackles all aspects including the design of a new logo for the city, the organization of five yearly city events managed by event experts and the use of urban furniture design. The city was granted last year a large amount of FEDER funds, European support for regional development (145 million euros ) to revitalize some of the city area referred to collectively as Charleroi District Créatif (DC). The objective is to solve the problem of urban exodus, to bring people together and develop the local economy. During our trip, we followed a trail of 3.8 kms along the Sambre canal leading to the train station. This is part of the "Boucle Noire" itinerary. On the way, one could see miles of ghost steel factories, footbridges, high furnace glowing reddish-yellows as the rust colour palette mixed with the green of the plants invading the area. A great initiative to use the decaying industrial heritage as an asset of urban creativity, inspiring many artists and photographers. Several parts of the city have been transformed by street artists. “Urban Dream” is an area along the industrial factories where many artists have expressed themselves. The Biennal "Asphalte" is an urban art event that has been created in 2014 and many of the original art works can still be seen around the city. 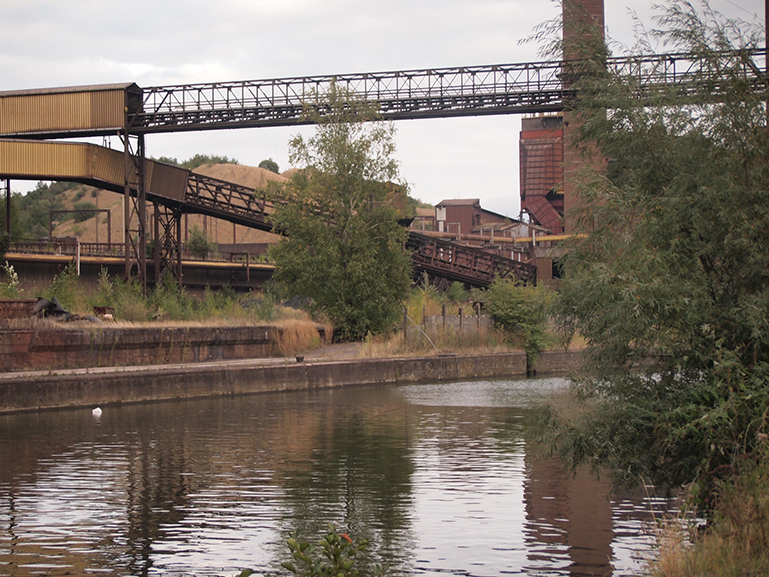 Les Forges de la Providence, one of the oldest steelworks in the valley constructed by English steel pioneer John Cockerill in 1836 has been converted into Rockerill. It includes a concert hall, event spaces and artist studios. 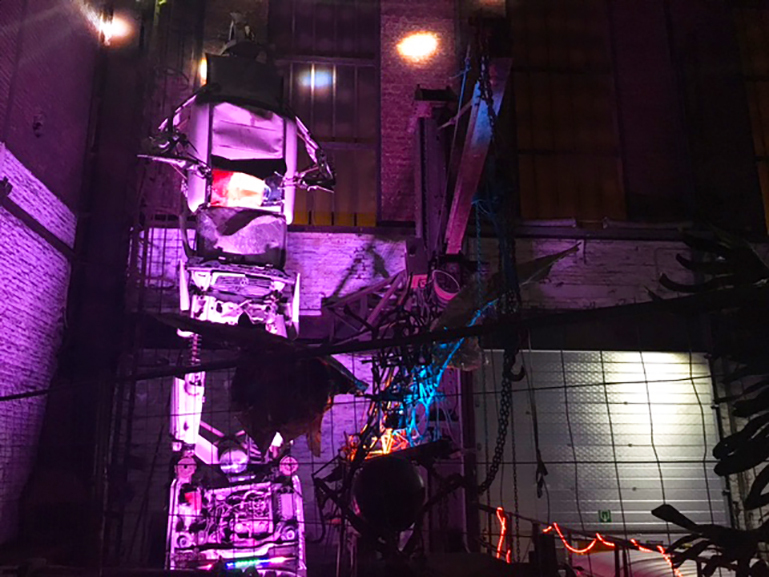 Art pieces made of industrial leftovers are exhibited all over the place and every weekends the venue hosts the very trendy " Apéros industriels" . The private sector has started to invest in the reconstruction of the city center. Some cultural initiatives look promising. Quai 10 is one of them. Based in the former branch of the National Bank of Belgium, this cultural centre will include 4 cinemas specialised in arthouse films, several spaces devoted to animated films and video games. It also hosts small creative entreprises such as Dirty Monitor, a leading creative studio in the field of video mapping and projections. La manufacture urbaine LaM.U is another business that will open soon nearby with three venues offering local products including a local brewery, an artisanal bakery and a coffee roasting facility together with event spaces. If you wish to experience the avant garde creativity of Charleroi in London, the dance company Charleroi Danses is coming back in February to the Barbican during the London International Mime Festival with their extraordinary Kiss & Cry show which was already shown in the past in the same venue.